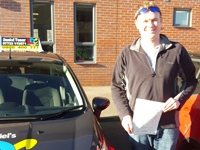 Daniel is a fantastic driving instructor that I would highly recommend to everyone! Everything about the driving lessons was perfect. Having not driven for 5 years, Daniel got me to test standard in a week and I passed after only 14 hours of lessons. Daniel makes sure the lessons work for you, looking at what your needs are and structuring lessons around you. He is very patient and puts you at ease during the lesson being very friendly and professional. 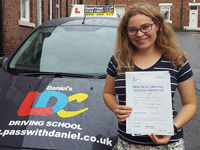 If you want top quality driving instruction that gets you a pass quickly, yet driving to a safe and high standard, then I would highly advise learning to drive with Daniel. Thank you! I would like to thank Daniel for being a brilliant instructor. He is so calm and patient and really knows his stuff, as well as being great at building confidence. He is very punctual and always filled the lesson time perfectly, so I was constantly learning new things, but never overwhelmed. I really enjoyed learning to drive with him and passed first time after just 16 hours of lessons! I would definitely recommend him.